Hiryu Falls (飛竜の滝) is the biggest and most famous waterfalls in Hakone. There are two waterfalls. Upper falls is 15m tall, and lower falls is 25m tall, and in total 40m tall. Hiryu Falls literary means the waterfalls of wyvern because the shape of the falls looks like Frying Dragon. It is located on the hiking courses. In Kamakura period, this falls was used for monks training, Takigyo. 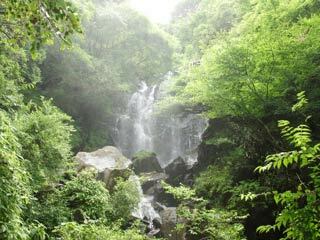 It is located on one of Hakone hiking courses. The hiking course to this falls is medium level. So, please well prepared to visit this waterfalls. The weather in Hakone is very ticklish.